With Monflo Server you can create Favorite games list on your PC to access it later with your Android mobile device. This allows to run your favorite games on Android easily just with a single tap. Follow the tutorial below to learn how to manage your favorite PC games. 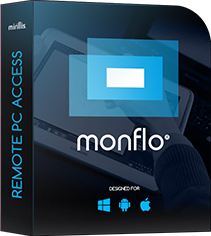 Run Monflo Server on your PC. Now navigate to Monflo favorites tab. Now to run your favorite PC game just tap your game title. Please note that Favorites are available only in Desktop control mode. In full screen PC game control mode Favorites are not available. To make it available you must close full screen game. To remove all or selected games from your Favorite games list go to your PC and use Monflo Server Favorites manager to remove items. When you remove a game from Favorite games list on PC it will automatically update Favorite games list on your Android device and remove respective item. If there are any problems with Favorite lists synchronization between PC and your mobile device and removed items are still visible on your mobile device even after Monflo Client app restart, please clear all favorites on both PC and mobile device. To clear Favorite lists on your Android device please open app Menu, open General settings and select Remove all favorites.